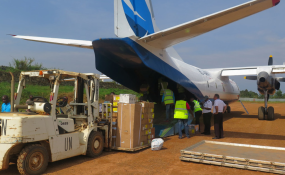 In Beni, north-eastern DRC, MONUSCO staff unload medical supplies and logistics from an aircraft, for use in the response against the Ebola outbreak in the region. Alongside the response to the disease, the country prepares to hold parliamentary elections on 23 December. With key national elections due next month in the Democratic Republic of the Congo (DRC), armed groups in the east of the country still threaten to derail the vote, the top United Nations official in the country told the Security Council on Tuesday. Leila Zerrougui, the Special Representative of the Secretary-General for the DRC, said that the provinces of Tanganyika and South Kivu, and parts of North Kivu, are most at risk. Armed group violence in these "key provinces" could affect the deployment of electoral material and prevent certain parts of the population from voting on 23 December, she said. Her briefing came as news reports cited the collapse of a short-lived deal by opposition parties in DRC, to field a joint candidate to contest the presidential election, against the ruling coalition's chosen candidate. President Joseph Kabila, who has been in power for 18 years, in ineligible to stand for a third-term according to existing constitutional rules. "It will be especially important for the Government to take steps in the coming weeks to secure polls, particularly to ensure the participation of women, who make up 50 per cent of registered voters," urged Ms. Zerrougui. A "level political playing field" will significantly enhance the credibility of polls, and contribute to post-electoral stability, expressed the senior UN official. In her briefing, Ms. Zerrougui, who also heads the UN peacekeeping mission in the country, MONUSCO, said that armed group activity is also hampering the response to a deadly Ebola outbreak in the country's northeast. "We are still seeing a growing number of cases in the major population centres of Beni and Butembo and significant community resistance to response efforts," she said, noting that women are disproportionately affected, representing about 60% of all probable and confirmed cases. This was due to a number of factors, including their roles as caregivers of the diseased, she explained, noting that MONUSCO will continue to support Ebola response "as a matter of utmost priority, taking into account a gendered-response lens." "There is the possibility for ethnic tension to flare up in certain areas of the Kasais," she added, noting that despite the remoteness of the area and the a very limited presence of MONUSCO, the UN mission has been supporting to relief partners and engaging with Congolese and regional actors to advocate for a more measured pace of return.